ST. PETERSBURG, January 21 – A fresh coat of blue paint adorns a Habitat for Humanity home in South St. Petersburg, applied by a group of Westminster Shores residents Monday morning. It was part of Habitat’s Martin Luther King Jr. Day of Service project, featuring six homes on one block being repainted and one additional having landscape work done, all with the support of local homeowners. 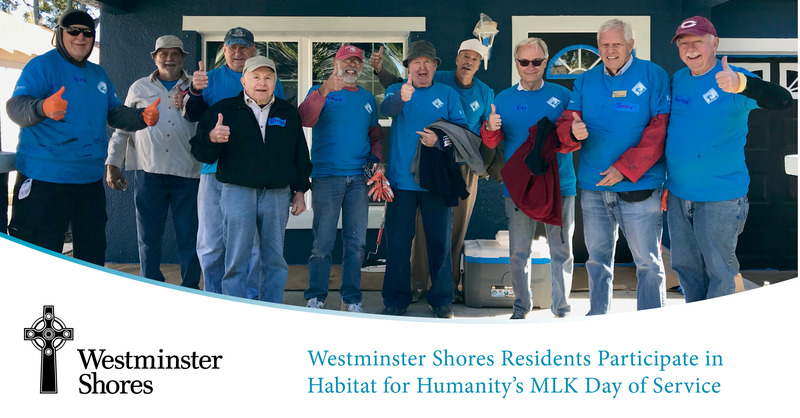 Westminster Shores is delighted to be a sponsor of this year’s MLK Day of Service, part of the community’s commitment to touching lives through service. The sponsorship helps pay for paint and supplies, with the labor donated by a variety of groups, from local companies to St. Petersburg High School. The lead grant for the project was provided by St. Petersburg College. Today’s house-painting was done on a home owned by India Kyler, which was built by the same group of resident volunteers in 2016-2017. “This is so wonderful,” Kyler said. “They’re like a second family to me, and are doing such a wonderful job.” Kyler has lived in the home since it was built, with her three daughters. Wielding paint brushes on one of the coldest mornings of 2019, Meese and a group of eight volunteers worked side-by-side with a group of St. Petersburg High School students to repaint the house’s faded coral stucco a cheerful shade of blue. Meese said that they had volunteered for several years on Day of Service projects, and that it was especially rewarding to return to Kyler’s home to refresh the paint, because they had helped build her home. In the last few years, Habitat for Humanity has built more than 20 homes in the South St. Pete area, with the support of many Westminster Shores volunteers. The Shores team even contributed to help build Habitat’s new office in the area. On Monday, King estimated that all six houses would have been completely repainted by lunchtime. Reverend Bill Hull, a Westminster Shores resident who has been involved for several years, said that the experience of volunteering for Habitat is incredibly rewarding — and another part of keeping Westminster Shores residents active through aging, as well as with the support of the community’s volunteers program.